Custom made and handcrafted In Arizona from solid mesquite wood. Old world doors custom made in Arizona. 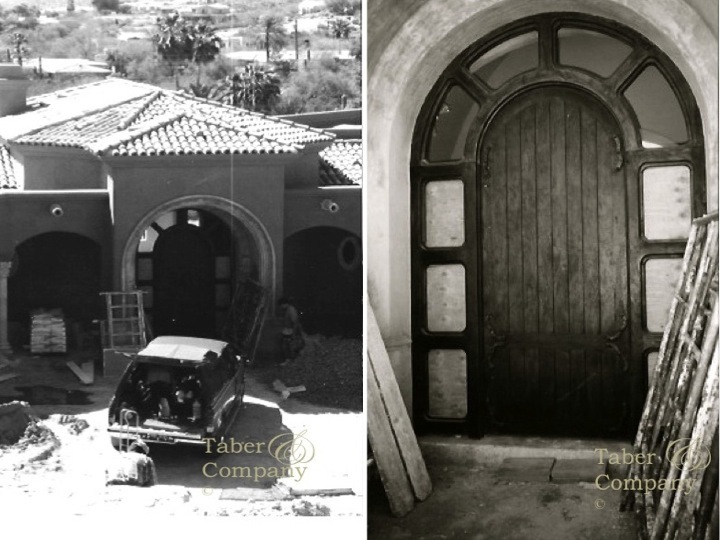 When we sold our first entry door to one of the most respected and talented home builders in Arizona we were destined to learn a lot and determined to create something special, everlasting and deserving of the opportunity. 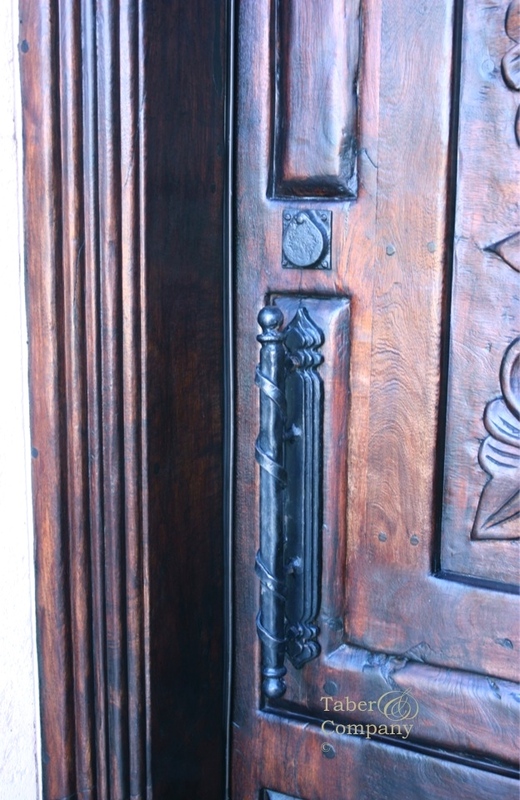 Old world doors are custom made in Arizona. 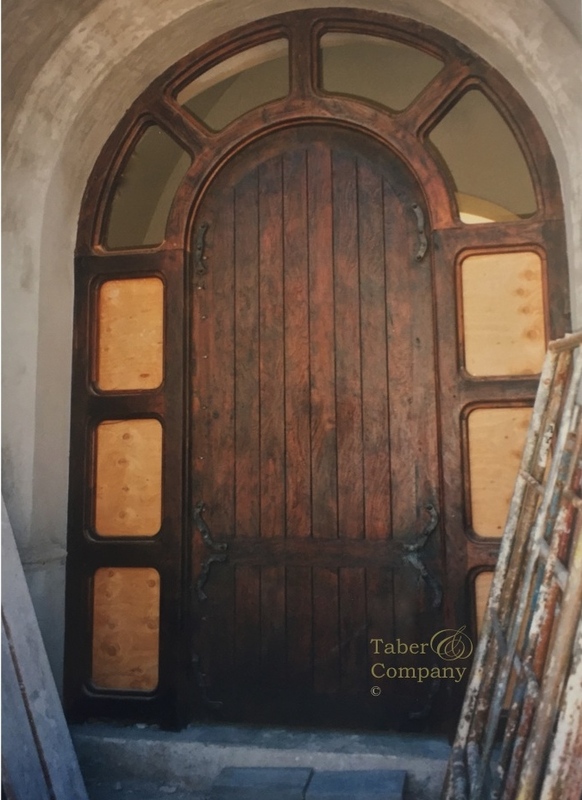 Taber & Company specializes in custom made solid wood doors. 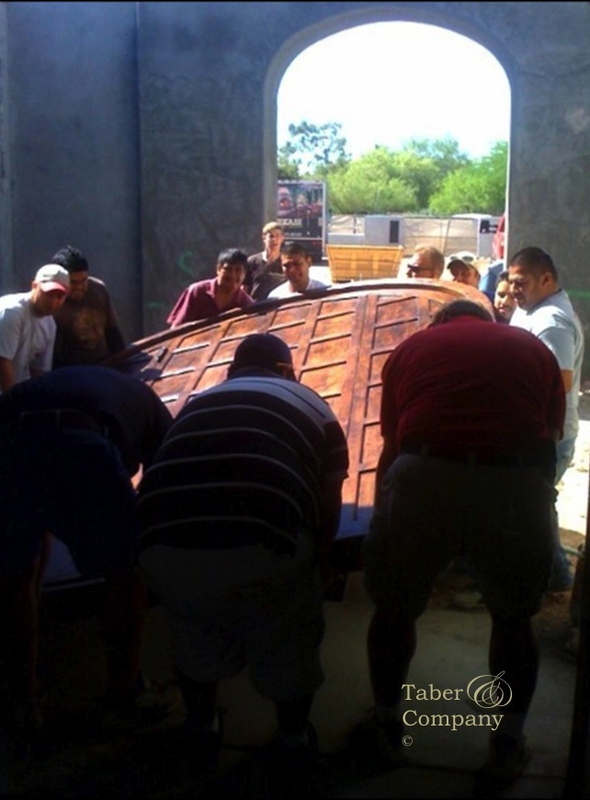 The massive door with sidelights and transom is over 11’ tall x 8’ wide, made of solid kiln dried mesquite wood and weighs close to 2000 pounds. The Mediterranean style wood entry door includes an enormous arched surround and was designed to accept custom made leaded glass, the door is made from 3” solid shiplap planks. In our usual fashion all of this was created by hand, starting with the detailed drawings, milling of the wood, door craftsmanship, forged iron and finishing. To this day we do not own molding cutters, every detail is formed by hand. The thick door frame with its layers of hand carved molding has all the character, undulation and beauty as the rest of the door, making an incredible statement in scale and proportion. 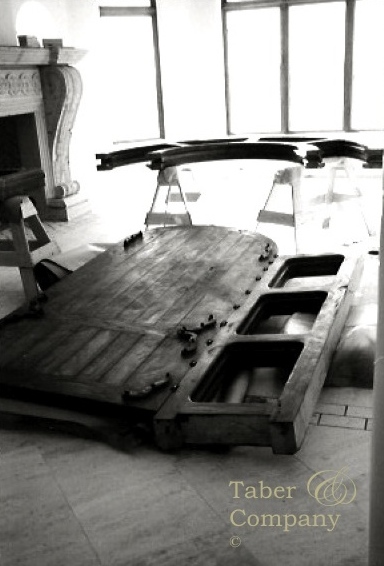 As the door evolved we knew that a manufactured hinge would not be in keeping with the true old world craftsmanship and we would need to design and forge iron hinges that not only looked authentic but could hold the weight of the door. Forged iron barrel hinges and door pulls have become a Taber & Co. trademark, designed and crafted exclusively for each piece. Details we felt passionate about included the threshold… how could you pass through this door and not experience the feel of a solid wood threshold beneath your feet, one that matched the scale of the door. Hand forged iron barrel hinges join the massive door to the door frame. Eighteen years ago we successfully mastered our first door and it has only been surpassed in size once… it was superseded by the homeowners brother.